A story over 2,000 years in the making! Watch history twist, change and unfold as the past and future collide! 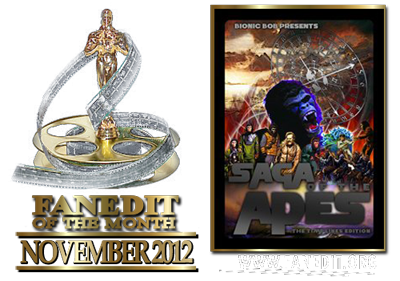 Observe the fall of Man and the rise of the Apes! To combine the first four classic Planet of the Apes films into one singular, mind boggling, time twisting, circular narrative! a multi-screen story format has been used, with stories unfolding in different time lines simultaneously before your eyes! spread over two volumes of alternate future history action! 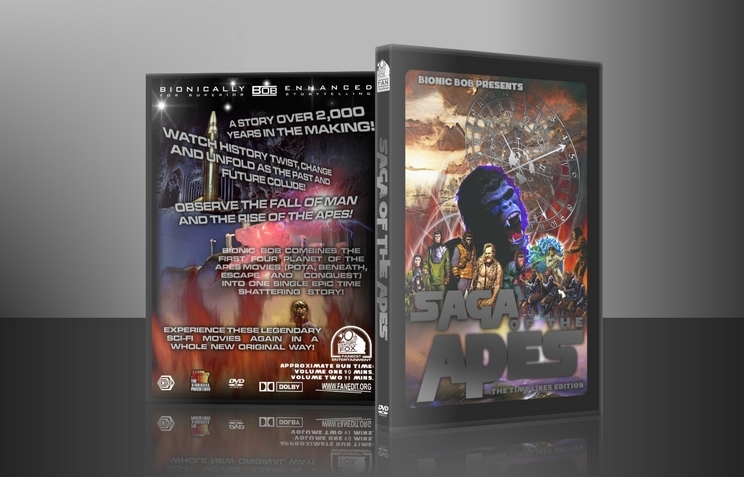 Prepare yourself for THE SAGA OF THE APES!!! My Volume One Previewers, Rogue my Artist Extraordinaire, and all those who supported this project. Honestly, I have no clear idea... LOL! Between what is cut and where movies overlap... it's a madhouse of editing. Anywhere from 20 to 40 minutes cut from each movie. This was long, but held my interest throughout. BBob's editing choices were always inventive, often uncanny. Excellent pacing, and the sprawling narrative was generally clean. Saga Of The Apes presupposes the viewer has a working familiarity with the chimp flicks. Fair enough. Were you going into this cold - you would be going out confused. Third act seemed helter skelter - that could have been me. Not a fan of split screen. Often confusing. The screens themselves seemed smallish. Audio fine. No jarring cuts or volume spikes. Video was nice. No editing errors to my eyes. I've watched ~20 fanedits without leaving any reviews, but this edit has motivated me to finally say something. I loved it that much. I probably never would have watched the apes movies again. I liked the first one fine and watch a few minutes of it when I channel surf and come across it. But I'll probably never be in the mood to actually pop in the dvds and watch them all again. This edit though - I will watch it again. There were a few things that bugged me. The end of part 1 and beginning of part 2 used some repeat footage. The scenes belonged in both places, but when watching the two parts back to back, it was a bit confusing. Also, though the split screen generally worked great, there were a few spots that it didn't. Generally, it worked well when scenes from different movies were shown on the different screens. It didn't work well a few times when you just used the split screen to show a single movie and just turn it into slo mo. But, the pros far outweigh the cons in this edit, my notes here are just nitpicks. Original: 8 (Planet of the Apes), 4-6 for the other three movies. Combining, trimming, and playing the events out side by side was an extremely creative way to provide a new viewing experience, one that for me is remarkably improved over the original sequels. What an excellent edit! What a labor of love! This is my new favorite way to revisit one of my favorite movie franchises of all the time. I get the complexity of your narrative, particularly on the first half. You made the much inferior "Beneath the Planet... " so much better and deeper on the second half. The use of multiple screens is powerful and effective. The only constructive criticism I am going to share is in the audio editing department. There were some missed opportunities during the multiple screens sequences where overlapping soundtracks could have made the experience more powerful...but that's about it. Overall for me this rates 10 out of 10. Man was this entertaining, loved the multi-screens, a really good and original fanedit. Everything started off with multi-screens then when it went to full screen I was blown away. It felt really epic. This is a fanedit that would be perfect to experience in a theater, then have intermission between the two parts. It was a long time ago when I last saw the apes movies and that mean I've forgotten a lot, but I think the faneditor did a very good job at started out the ? and he also made part2 less awful, at least as I remember it. I was really impressed with the dvd menus, looks like a bought dvd. Can't remember I've ever seen fanmade menus looking this good. 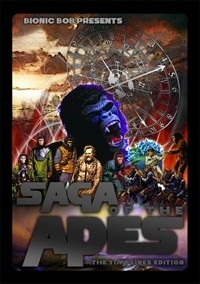 Yeah I don't know what else to say, if you haven't seen it and like the apes movies, watch this now! It's a keep, that's for sure! Finally got around to watching this edit and it is just a super cool way to watch the whole darn Planet of the Apes saga in one sitting. (except Battle for the POTA, which is a fairly irrelevant and pointless sequel anyways) BionicBob is rapidly becoming one of my favorite editors. He has a real instinct for storytelling and maintaining the flow. The use of multiple scenes on the screen was remarkably effective in telling the dual stories simultaneously. I still haven't been able to answer the question I raised in the forum, which was whether the story as it is cut could be made sense of by a novice to the POTA. I tried to get my 15 year old son to sit and watch it, but to no avail. He has only seen this 21st century versions and I wanted to see if he could follow it. If I get this done, I will report back. This is a short review because I really don't have any nitpicks with the edit. Any nitpicks would be with the source material, outside the control of the editor. Great job Bob and congratulations. Your creativity and technical acumen are outstanding.